My second number two stands out for being more topical than the only current event contender, Captain Phillips, despite being set in 1985! Much like Nebraska, I went in knowing basically nothing about this film and it blew me away! 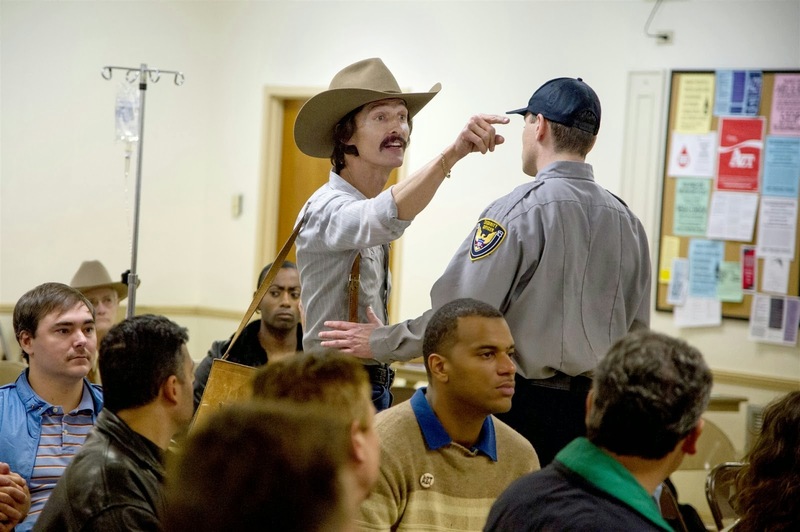 Dallas Buyers Club (2013) is a historical piece by Jean-Marc Vallee. Ron Woodruff is a nard drinking, drug abusing, bull riding Texan who collapses after hustling some men. He awakens to find himself in a hospital. The Doctor tells him that he has HIV and he only has about thirty days to live. He sends 28 of them banging prostitutes and doing drugs. He learns of an experimental drug and obtains it illegally; however his condition only worsens. He makes it down to Mexico to discover a better treatment that the FDA won't approve, and he decides to make some money! With all the fights over new drugs and how the FDA cozies up to big businesses, this film is incredibly relevant to today. I'm not even talking about the AIDS stuff yet. The movie even has the balls to admit that the drug Ron Woodruff crusades against, ADT, is still used today and can be helpful in staving off the virus. However, the real fun lies in the characters and their struggle against a virus that was heavily stigmatized at the time. Ron Woodruff gradually becomes a better person as a result of being infected with HIV. In a weaker film there would be big melodramatic scenes detailing his transformation, but this film makes it effortless. Ron is charismatic and unrelenting in getting what he needs. I'd like to know when Matthew McConaughey became an amazing actor. Previously he played varying versions of himself, but not here! Rayon is a transgender woman who helps Ron with his scheme to get the drugs to those who need it. Rayon's first scene, where she swindles Ron at cards, is the greatest character introduction of the year. Rayon is the heart of this film and her struggles are just as important as Ron's. If Jared Leto wins Best Actor in a Supporting Role, I think he deserves it. I didn't give it to him because he's part of a great film with a wonderful ensemble cast, not carrying an overhyped movie on his back. Dr. Eve Saks is a doctor who treats Ron and Rayon; she is the one doctor who sees the merit of what he's doing. She exists to show the medical side of things, and that not all doctors are stooges of the FDA. Jennifer Garner is the weakest part of the stellar cast; not that she's bad, just notably not as good. The film doesn't start with a date though it becomes clear that this is a period piece very quickly. The AIDS scare is just ramping up, and the effect on the homosexual community is great, especially the Ron in a gay bar scene. I'd give the film Best Editing and it better win Best Makeup! It also has the best trailer of the year in my opinion. Ron becomes a good man. 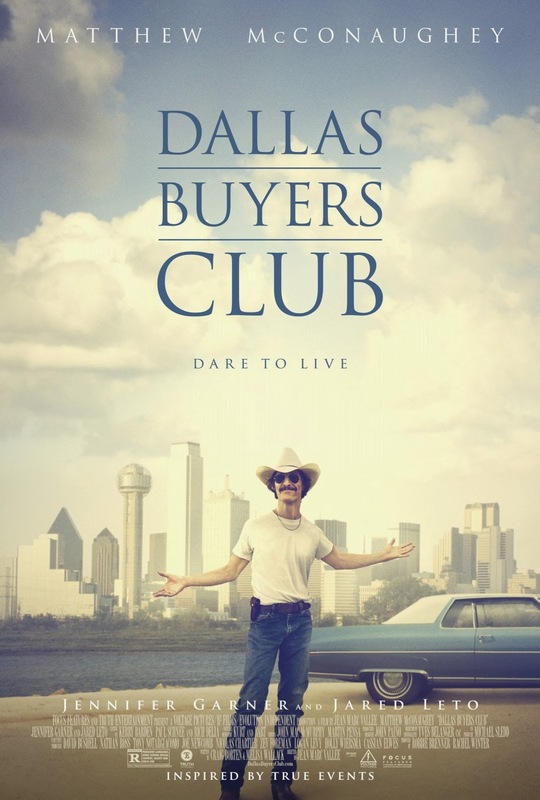 Dallas Buyers Club presents a story that transcends its time period. The phenomenal casting, direction, and script merge into a funny and heartwarming story that leaves the viewer with a lot to think on. See it if you enjoy a good story and great characters! Next Time: And the Number One film is...the only one left.